It has become an annual rite of passage for the Los Angeles Lakers to play the marquee Christmas Day game. This year, the Lakers hosted the two-time defending NBA champion Miami Heat. With Kobe Bryant sidelined due to a knee fracture, the Lakers are not the team they once were. But, when LeBron James is in town, it is always a big game. As expected, the Heat beat the Lakers 101-95, with LeBron totaling 19 points and 8 rebounds in the win. After the game, an iFolloSports.com contributor and his sister happened to be at the Beverly Wilshire Hotel, Miami's Beverly Hills property of choice. 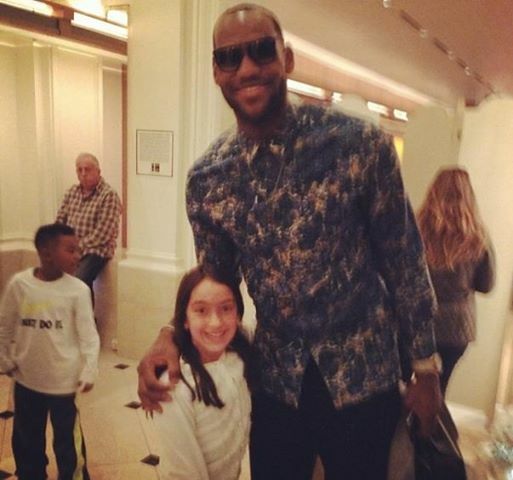 The contributor's sister, who is a huge LeBron fan, saw the MVP in the lobby and asked him if he would pose for a photo. In the holiday spirit, LeBron obliged. Above is the photo of LeBron and the contributor's younger sister. What a great thrill and holiday gift for her to say she met the game's biggest star and perhaps America's most prominent athlete. LeBron has pretty much come all the way back to his good guy image, after it hit rock bottom, as a result of the way he left Cleveland. His new Samsung Mobile commercial series might be the best and most entertaining ad campaign, currently on television.